Online lenders like Kabbage have stepped up to fill the huge funding gap for small businesses since the financial collapse. Even though the economy has boomed and the stock market has risen from its 2009 crash, banks just haven’t been as willing to lend to small businesses. Kabbage and other business loan competitors offer a quick alternative to traditional loans because of the speed at which loans can be made and flexible terms. But there are plenty of loan scams. Lenders know most small businesses won’t qualify for a traditional loan. Some will use that to stick it to you for as much as they can get. I’ve run my own online business since 2013 and have taken several loans to fund short-term projects. Online lenders like Kabbage can save your business but can also cost thousands in interest and break you if you’re not careful. I’m using this Kabbage review to highlight the online lender and five other business loan competitors. Make sure you check out the side-by-side comparison for loan requirements, interest rates and how to choose which provider is best for your needs. Kabbage is an online lender specializing in short-term business loans for working capital. Loans are available up to $150,000 and for terms up to twelve months. The business loan website uses criteria other than your credit score to approve a loan, making it a good alternative for business owners that may not have good enough credit to get a traditional bank loan. There are some major drawbacks to Kabbage loans which I’ll cover in more detail below. Interest rates are quoted as a percentage, but the actual annualized rate can be much higher because the loans are paid off in less than a year. Of the five Kabbage competitors reviewed below, Kabbage is a better choice on some counts but most business owners will be better served by other sites. When you’re talking about interest rates at 50% and higher on a business loan in the thousands, it pays to take a little time to compare all your options. Kabbage advertises its rate starting at 15% though expected APR on most rates will be between 30% and 50% annualized. A lot of the difference is due to the fact that these loans are due in full within 12 months. A loan at 15% interest on six-months’ terms is actually equal to 32% on an annualized basis. It’s a very common mistake among business owners seeking short-term funding loans. Lower rates look acceptable but are not comparable against APR rates on longer-term loans. In fact, borrowers are usually better off taking out a longer-term loan to cover a few operating cycles of cash needs if they can get lower rates. Kabbage loans are available for between $2,000 to $150,000 on terms up to one year. 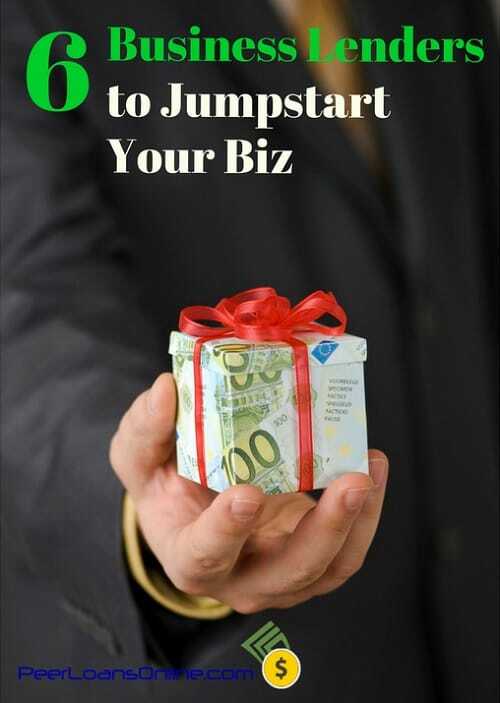 Business owners need at least $50,000 in annual sales and a credit score of 550 FICO. Kabbage charges borrowers the interest rate plus a fee between 1% to 10% each month on the amount borrowed. One benefit to Kabbage loans is the ability to use it as a line of credit, borrowing only what you need. That means you pay interest only on what you’ve borrowed but the interest rate plus fees really adds up. The business loan calculator below shows an example of fees and interest on a $35,000 loan on a one-year term. I estimated the fee at just 4% though it can go as high as 10% each month. Even on a one-year term and low fees, the rate would equal 30% on this loan. The market for small business loans is tough with strict requirements by most lenders. Kabbage doesn’t require as much in annual sales and can accept bad credit borrowers but you pay for it in higher rates and fees. That’s why it’s critically important to check your rate on at least two or three business lenders. Most will do a soft-pull on your credit to estimate the rate, so it won’t affect your credit score. Saving just 5% on a $35,000 loan can save you almost $2,000 in the first year alone. Lending Club is the world’s largest peer-to-peer lender and has been moving aggressively into business loans. Minimum sales requirements are the same as Kabbage at $50,000 but you need to have been in business for two years or more. Business loans from Lending Club are available for $5,000 to $300,000 making it one of the few lenders appropriate for large funding needs. Personal loans are also available for up to $40,000 and may be an alternative if you don’t qualify for a business loan. Rates on Lending Club start around 10% and all loans are available on terms up to five years. That gives you a lot of flexibility to lower your monthly payment and borrow for longer-term cash needs. OnDeck is one of the most popular business loan providers but also charges one of the highest rates. Loans are available for up to $500,000 but only on terms up to 36 months. You’ll need to show $100,000 in annual sales and at least 12 months of operations to qualify. 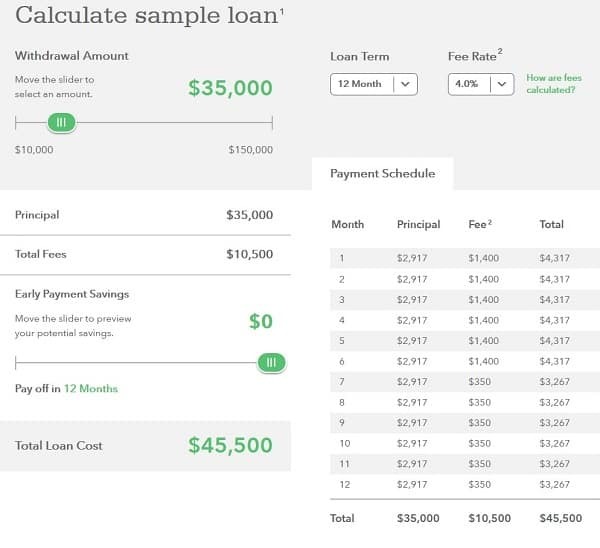 Like Kabbage, OnDeck publishes a non-annualized interest rate when it estimates your loan cost. Payments are due on a daily basis and the actual APR on loans is much higher. Expected APR on loans is generally between 30% to 50% depending on repayment terms. NetCredit is a personal loans provider but specializes in the kind of short-term credit that can help business owners pay for working capital expenses. You won’t need to show past sales or a minimum operations, making these loans perfect for startups. Rates on personal loans start around 30% but you can prepay with no penalty. Unlike Kabbage loans where fees are paid mostly during the first six months, NetCredit loans charge a consistent interest rate so there is an incentive to prepay. Loans are available for up to $10,000 and on terms up to five years. PayPal Working Capital is an interesting alternative to Kabbage and other business lenders. If you collect payments through PayPal, you can borrow up to 30% of your annual sales and pay a one-time fee. You repay your PayPal loan as a percentage of your future sales, from 30% to 70%, and only on the days you collect payments. Applying for the loan, PayPal will estimate your one-time fee depending on loan amount and the percentage you choose to repay. PayPal automatically payments from your account every day you have sales until the loan is repaid. There is also a minimum repayment amount for every 90-day period, either 5% or 10% of your amount plus fees. The one thing I don’t like about PayPal Working Capital is that it can be difficult to compare the loan to others because it charges a fee instead of an interest rate. Don’t be fooled. This fee works out to an interest rate just like the fees charged by payday lenders. 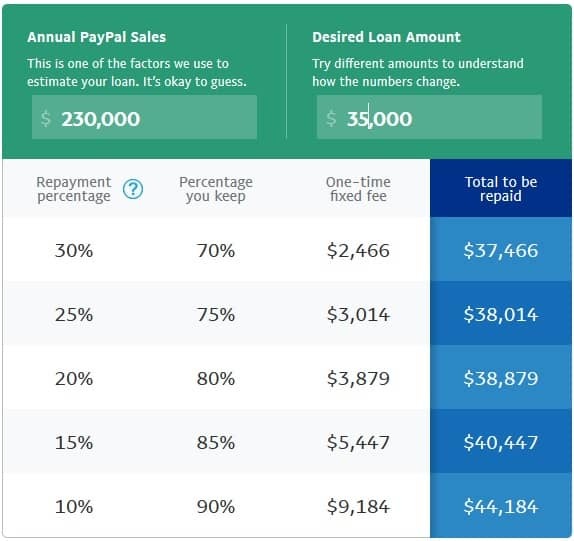 The fee on PayPal loans generally works out to between 14% to 20% as an annualized rate. That’s still pretty good compared to many business lenders. You’ll need at least $20,000 in annual sales and loans are capped at 30% of your sales so it may not help all business owners. StreetShares is another p2p lender, this one specializing in veteran-owned businesses. To qualify for a StreetShares loan, you need a personal credit score of at least 600 FICO and a year in business with at least $25,000 in sales. Loans are available for up to $100,000 and on terms up to 36 months. There is no loan fee but the process is longer than most other lenders. You’ll need to show all outstanding business debts, sox most recent bank statements, financial statements and your personal and business tax returns. A few of the business loan competitors offer the opportunity to take your loan as a line of credit. It’s one of the benefits of using Kabbage because you only pay interest and fees on the amount you actually borrow. Getting a line of credit for your business is the same as applying for a loan on most websites. You’ll fill out the application form and submit any documents. The entire application usually takes less than ten minutes as long and a decision is made instantly. Once you are approved for a loan and accept the terms, you will be asked if you want the entire proceeds or if you want to take it as a line of credit. If you want a line of credit for your business, it works like a credit card. You only borrow the amount you need and can borrow more from the rest of the loan later. One thing to watch for in business lines of credit though is the fees charged by the lender. Sometimes fees are fixed on your loan so you pay the same fee whether you borrow $2,000 or $20,000. Paying a $2,000 fee on a $20k loan isn’t bad, only about 10% on your money. Paying that same fee on a $2,000 loan would be a 100% interest rate! If the loan fee is the same no matter how much you borrow then it’s best to just borrow all you need at once and pay the loan off. If there is no loan fee and you’re just charged an interest rate on what you borrow, a line of credit can be a good alternative. What Online Lender is Best for Your Business Loan? The different fees and terms on business lenders makes it difficult comparing them side-by-side. Some charge fees while others charge a rate. Some offer longer-term loans while others only offer capital for very short-term needs. You’ll always want to compare rates and fees on a few lenders to make sure you get the best deal. I can only offer my experience and opinion as a business owner and financial analyst. If you qualify, Lending Club is usually going to provide the best rate and terms for a business loan. You can borrow a higher amount which keeps you from coming back for another loan and payment terms are easier. 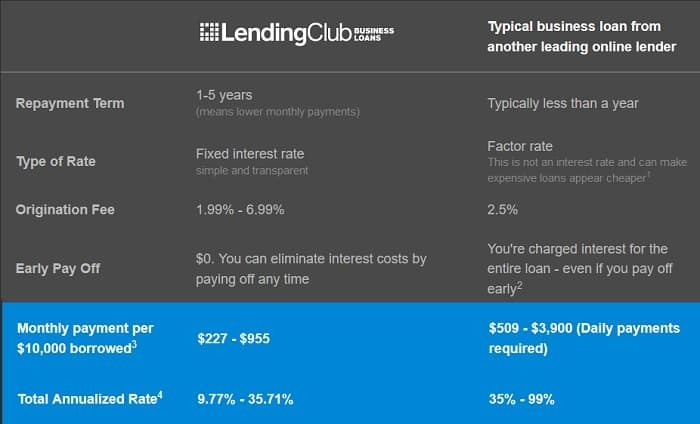 I’ve found Lending Club to be the most transparent of the business lenders, always showing you the annualized rate so you know the exact cost of the loan. PayPal Working Capital is also a good option but you need consistent sales through the platform to pay off the loan. It can be easy to lose track of payments and how much you owe because the platform only deducts when you have sales. NetCredit is a good alternative if you don’t qualify for a business loan. Rates are comparable with Kabbage and other lenders while requirements are much easier to meet. The website specializes in bad credit borrowers so you generally don’t have to worry about your FICO score and you can use loan proceeds for anything. Kabbage and its business loan competitors are a good opportunity for entrepreneurs that can’t get a traditional bank loan. Rates will usually be higher than a bank loan so make sure you understand exactly how much you’re paying and that you can meet the monthly payment. I like Kabbage for its line of credit option though the fee structure is confusing and can be more costly than you understand. Make sure you compare loans across different business lenders so you get the best rate possible.